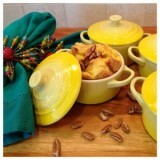 This recipe is for 4 Le Creuset Mini-Cocottes of French Toast Bread Pudding! You can adjust for a baking dish - Just slice the bread about 3/4 inch thick and use an entire loaf of bread. We say yummy to Taste of Home for this recipe! We loved it so much we added it to our Copycat category! Don't you just love fresh herbs in the summer. We have pots of herbs along our walk way and it smells amazing. At the lake we do a lot of entertaining and making my Fresh Herb Chimichurri Chicken Kabobs are always a hit! I like to marinade the prepared kabobs in the refrigerator for several hours. Then save some of the pesto to serve along side the kabobs. Delicious! Cindy's Tip! If using wooden sticks be sure to soak in water for at least 30 minutes before preparing the kabobs. That will prevent the sticks from burning while grilling! I bought a fresh pineapple along with other fresh fruit for the weekend. We never cut open the pineapple and I kept moving it around the kitchen and finally the pineapple became my centerpiece. After a couple of days I decided to make a Fresh Pineapple Upside Down Cake and this dessert was enjoyed by my lake neighbors. I used a 9x9 metal pan. My initial thought was to prepare this in a cast iron pan but mine is at home in Connecticut and I am baking this at our lake house. I do plan on making this again using my cast iron pan. 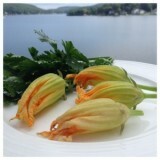 I have been eating and making zucchini blossoms for as long as I can remember. My nana would make sure my grandfather picked them as soon as they were perfect! As a little girl we would fill them with ricotta and mozzarella cheese but I am going to share a delicious paleo recipe for you to enjoy. You can opt to just fry them but I feel adding a little goat cheese and scallions make this a little extra special. I am the queen of frittata's! While at Shop Rite, E. Hartford I picked up an acorn squash not know what the plan was but it felt right to grab one! My husband is traveling this week in Germany and I was cleaning out the refrigerator and decided to make breakfast with the acorn squash. I used 1 egg and 2 egg whites as my choice but I will list 2 eggs in the recipe. You decided! This is such a fun breakfast to make and perfect for sharing! I opened the drawer in my refrigerator and took out all of the vegetables to make this perfect Paleo breakfast in a jar! Save those left over roasted vegetables for your breakfast. I just love a frittata with roasted sweet potatoes, kale and onions! Yum! 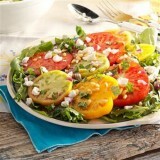 Cindy's Tip: If you are making these to enjoy during the week let them cool completely then seal and refrigerate. You can warm in the microwave. I love avocados but hate when they go bad on the counter! I am sure you have thrown them away and was not happy about it! Well I had 2 on the counter and decided to bake it with a frittata in the hole! I used leftover cooked bacon but you can use sausage or any other left over meats or even vegetables from dinner last night. Of course your Ninja makes the best Margaritas! Ninja know-how: subsitute frozen strawberries for the ice in this recipe and make a delicious strawberry margarita. 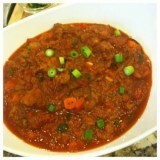 When I make chili for family or friends it is certainly full of meat and flavor! 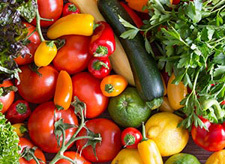 This is also a great paleo recipe for everyone to enjoy. If you enjoy dairy add shredded cheddar or sour cream on top or even sliced avocado!